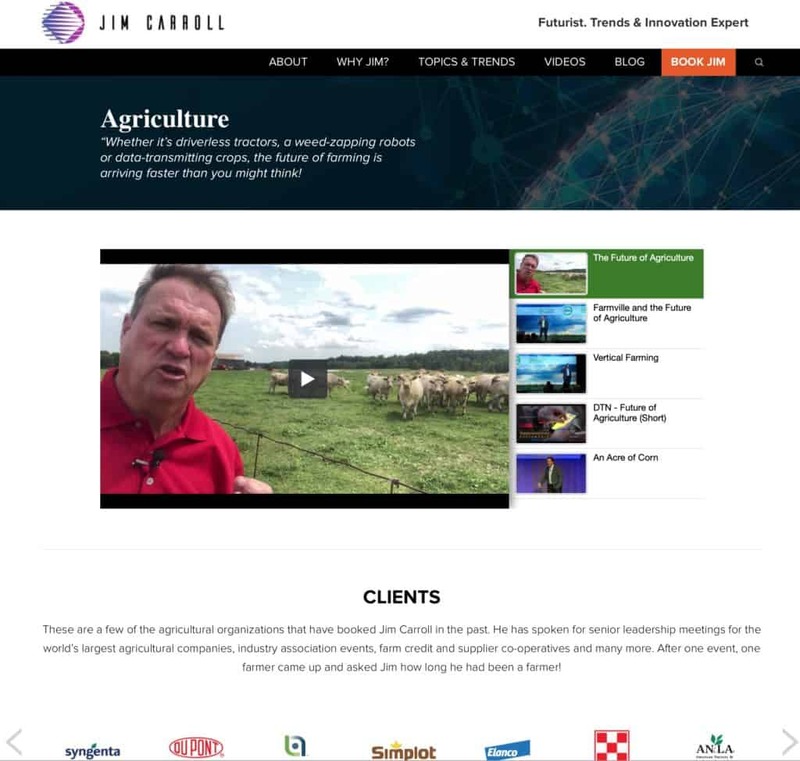 The Story, Company and People Behind the Process: The JimCarroll.Com Redesign! 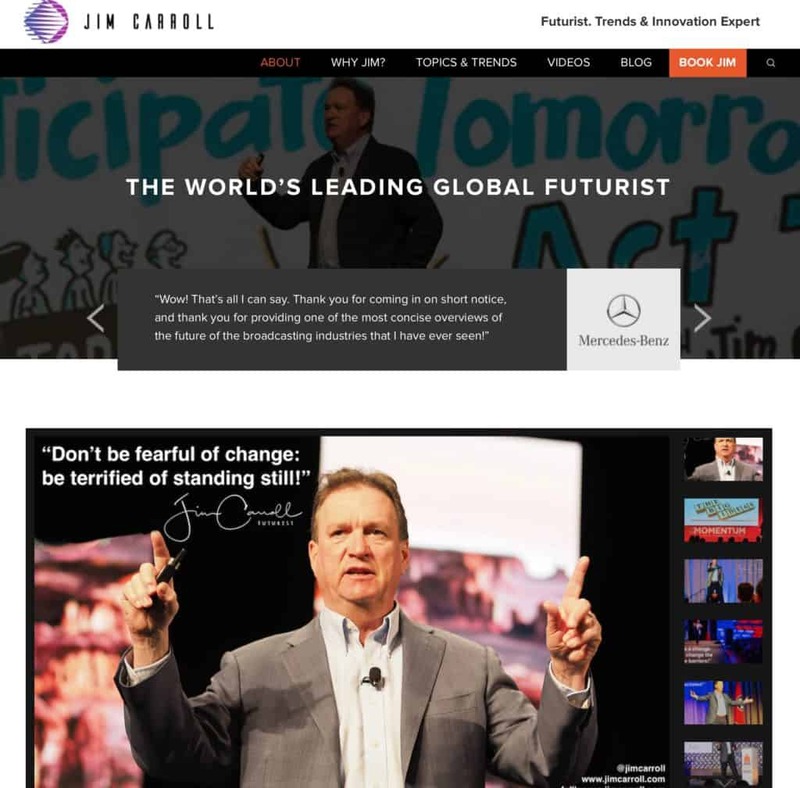 Home > Blog > The Story, Company and People Behind the Process: The JimCarroll.Com Redesign! Hey, take a look around! 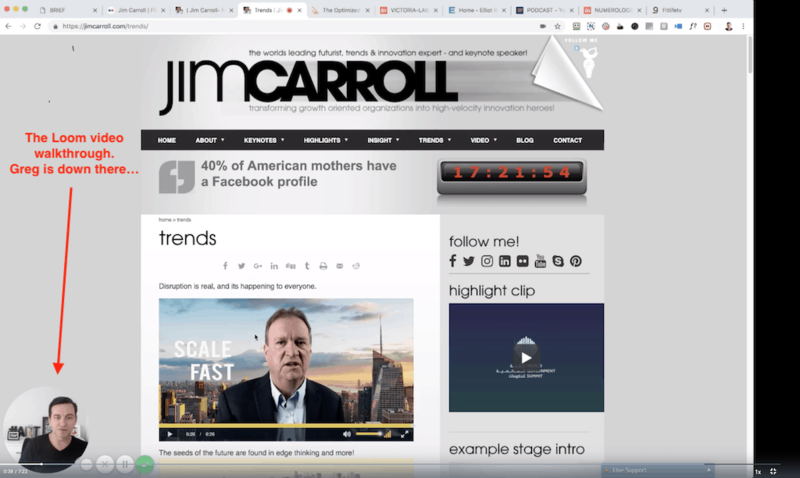 The new JimCarroll.com Web site is up and it absolutely rocks! You are reading it right here. It’s not easy to roll out a new site that does several things all at once – be responsive, mobile and cutting edge in design ; reorganize my insight and speaking career into a structuren that captures the extent of the work that I do; migrate 17 years worth of Web content as part of the process of doing so…. and force me into a way to compartmentalize my thinking into an easily navigable format. But the fact is, I found the perfect partner to help me do so through Melbourne, Australia based Studio1Design and it’s leader, Greg Merrilees. This is the story of how it came about – a fascinating worldwide project involving people from on 6 countries and 5 continents around the world! If you are intrigued by what you learn, you’ll find a link to Studio1 at t the bottom of every page of my site. I’ll leave it there, so that someone else might be able to discover their magic! I’m absolutely thrilled with where I’ve ended up, even as the project is ongoing as I clean things up, reorganize and more. In particular, there is work yet to be done to help people discover all of the insight built into 17 years worth of posts on creativity, trends, the future and insight…. One of my most important goals with a new site was to be able to have my daily inspirational quote – which I’ve been doing every weekday morning for 2 and 3/4 of a year now – easily integrated into my site. it’s become my morning obsession! And so on the About page, sites this mornings quote. If you click it and read it, you’ll actually find a post about how overwhelmed I was in taking this project on! Ellery, part of the Studio 1 coding team, and located in the Philippines, for the coding work in bringing my custom WordPress theme to the world. He displayed great patience in dealing with my never ending questions, comments, requests for just one more thing! Armine aka “Alex” — located both in Russia and Armenia – my overseas video editing partner who has been helping me out over the last 2 years. – you’ll find her professionally done videos all over my Web site. Right now she’s working on 2 speaking highlight videos which will come up in the next few weeks! Gamage, located in Sri Lanka, a fellow I found on Upwork, did a lot of the legwork in getting all 800+ daily inspirational posts over to the new site with images and text, as well as other projects.Rock star diligence and focus on his work – super organized! A lot of timezones, and a lot of people for a guy like me who lacks in organizational capabilities. Throughout the process, my family got kind of sick of me – such as when I would quickly leave the dinner table to answer some email from the Philippines as they were waking up on that part of the world! Back to the site. One of my biggest goals was to combine my “keynote topics” and trends insight into one section – on my old Web site, things were spread all over the place. I think we accomplished this! Take a look at the Agriculture page, under Topics & Trends. a nice visual list of some of the clients I’ve worked with in this industry – credibility counts! a quick link to specific blog posts that are about or relate to the agricultural industry – a gateway into my mind! I avoided this project for a long time – my last Web design was in 2009 – simply because the scope and scale of the project overwhelmed me. And yet I knew I had to take the plunge. One day circumstances drove me into a path that led me there…. So how did I find Studio1? Through the wife of my good friend Mark Jeftovic – he’s the owner of easyDNS, and was mentioned in one of my first books 25 years ago. His wife had published a new novel, Torn: A Forensic Romance, under a pseudonym. While reading about the book upon launch, I noted a tiny button on the bottom mentioning who built the Web site – so I clicked on it. I then browsed around the Studio1 site – like I had for so many Web design companies over the last 5 years. Yet I was impressed by the work I saw, so I fired off an email. Before I knew it, I had a video e-mail response from Greg. I ignored it for days – it must be some other video come-on extolling their work!. 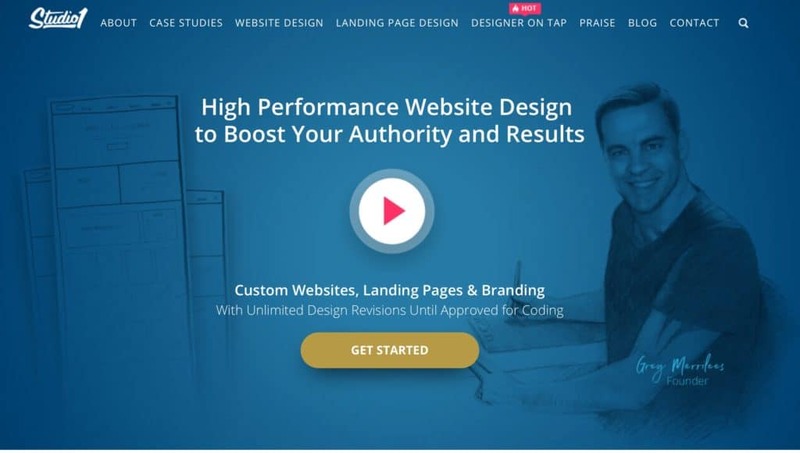 Most Web design firms fire out generic marketing crap pap! Here’s the thing – I pride myself on the fact I approach every keynote and event with customization in mind. Browse my site, and you’ll learn that. And that’s what I saw when one day, I opened the video from Greg. It wasn’t a puffery promo piece – it was an epic 10 minute video overview from Greg, using a technology I did not know, Loom – with a concise overview of who I was, what I do, the elements I needed in a new Web site to capture that, and a pathway to get there. He took apart my current Web site, identifying exactly what we must do to capture “me” in a new, modern site. I signed on late in December, and waited patiently until the holiday season was over – and then we fired it up the project. I’m thrilled with where I ended up even though there is a lot more work yet to come! Sometimes you need to reinvent yourself. To get there, find a great partner – I certainly found one in Studio1!